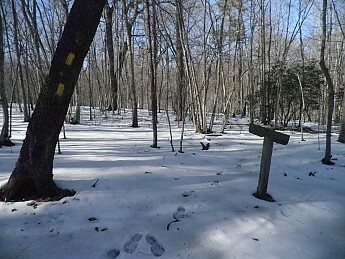 On Feb 8 I joined the Uwharrie Trail team to help cut a section of newly restored Uwharrie Trail. After many years of obscurity and lack of public access, the venerable UT will soon be restored to its former glory. I was happy to be a part of the process on this day. I will continue with this wonderful team to make the UT completion a reality. 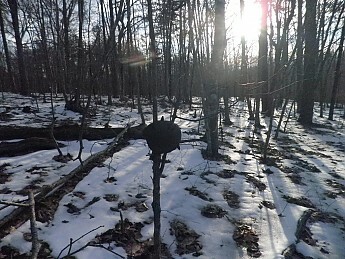 On Feb 15 I returned with the goal of digging out the spring at Camp 7 and performing some gear testing in the slushy conditions. I arrived fairly late in the afternoon, but only had about a 1 mi. hike in to my destination for afternoon and night of camping out. I made it to Camp 7 after about an easy hour of trudging through the slush and thoroughly soaking my boots that unexpectedly leaked! Bad mark on the Merrell Phaser Peaks. 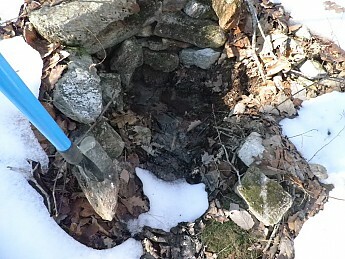 I arrived at the spring and dug out about a foot of muck from the bottom allowing the fresh water to pool nicely for collecting. 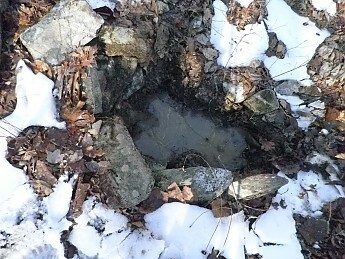 I hope on my next visit to have time to line the spring with some rocks and maybe widen it out a bit - perhaps even installing a small pipe. 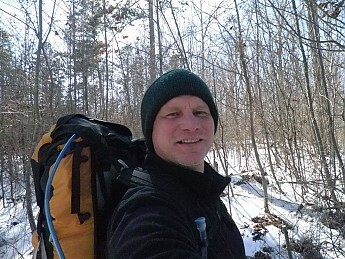 Not wanting to stay down in the hollow at Camp 7, I climbed back up the little hill and picked a flat spot on the ridge. I tried to find the “least thawed” spot possible. I cleared the slush away and set my ground sheet and fly atop some really soggy leaves. I did not mind, because this gave me a good opportunity to test some gear. The night was not so cold, bottoming out about 30F. I slept very well enjoying the winter stillness. 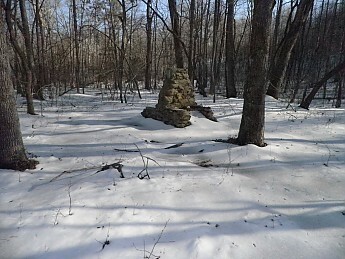 The woods were quite beautiful with the snow cover and the sun shining. I enjoyed the way the shadows fell on the forest floor. I tried to get some late night shots with the full moon, but my little camera was not up to the task. 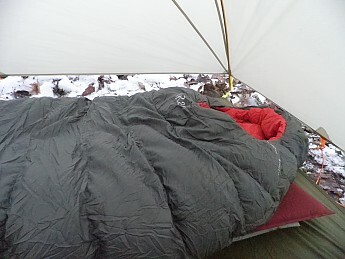 I have found that the Big Agnes Fishhook UL 2 fly configuration works great for winter camping. I especially like the extra space where I can stay clear of the walls, sit up, and even store my gear if I need to. I really enjoyed this quick overnight. The camping looks like fun but I don't want to think about digging out a spring this time of year. I'll probably never walk that trail but thanks for your work and for sharing the pics. Ah trail work, very cool! Not work really, I think it is kind of fun in my own twisted way! The Uwharrie Trail was originally 33 miles long, not counting road stretches. Over time hand-shake access agreements dissipated, and we lost a whopping 20 miles in the middle. Now the Land Trust of NC has about 95% completed agreements to make this unique trail 40 miles long. We are so close to a truely unique and wonderful hiking experience in Central NC, through the oldest mountains on the continent (in theory anyway). LOL! Your winter "selfie" and your avatar "selfie" are almost identical. Great write-up! The UT is one of my favorite trails to hike. I'm about an hours drive away. Let me know about trail work. My schedule may not permit this spring but I'm sure I can get down a couple of weekends this fall. Thanks Joseph. You can find out all about the events from the face book group "Uwharrie trail happenings".